There are many reasons the torch has been closed since 1916: it is very difficult to access; it was never designed for tourists (indeed, none of the statue's interior was built to host millions of visitors, giving rise to many of the statue's structural problems of the last few decades); the climb from the shoulder to the torch was done in near darkness. When it became clear that the fires were too large for the night watchmen to fight on their own, the Jersey City fire department was called in; however, it was too dangerous for them to proceed and at 2:08a.m. the first of a series of explosions rocked the island. Shrapnel and munitions were blasted in every direction; some lodged in the Statue of Liberty (which ultimately cost $100,000 to repair), some made it was far away as the Jersey City clock tower, stopping the clock at 2:12 a.m. 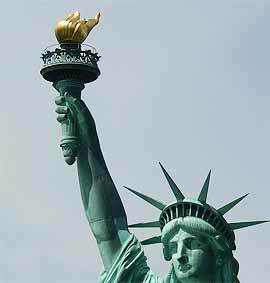 The torch cams will go online on Friday, October 28, and can be accessed at http://www.earthcam.com/usa/newyork/statueofliberty/?cam=liberty_str. * A handful of maintenance workers have been allowed access to the torch since 1916, but no regular visitors. Still, that doesn't stop a lot of people from reminiscing about having "gone up to the torch" in the 1940s and 50s. Unless those people were VIPs or statue staff, it is very unlikely. In November 1883, a New York Times reporter took his readers on a walk along “the most peculiar of the many unique thoroughfares which lie within the limits of this City”: Thirteenth Avenue. Today, the street is even more peculiar—only one block of it remains, stranded and inaccessible on a pier in the Hudson River. Thirteenth Avenue was created on April 12, 1837, when the New York State Legislature passed an act to “establish a permanent exterior street in the city of New-York along the easterly shore of the North, or Hudson’s River.” The act drew an imaginary line from West 11th Street to 135th Street in Harlem, and it permitted the city the rights to oversee the development of all the land that would be created by land-filling out from the city’s natural coast line. While real estate speculators immediately began buying and selling lots in Hudson that could someday be filled to become properties that fronted Thirteenth Avenue, the new street was slow to develop. By the time the Times reporter was walking the street in 1883, only a few lots north of Thirty-Fourth Street had been acquired and the street dead-ended in a high wooden fence somewhere between Twenty-Sixth and Twenty-Seventh streets. Despite the city having passed a measure to pave the street in Belgian block in 1874, its lower regions were still a “dreary waste” according to the Times. The street appears to have been the home mostly to lumber yards, saloons, and city dumps, where Italian women would “swoop down like a flock of vultures” when the ash cart arrived, hoping to find hot coals. Three years later, in May 1886, the Times dispatched another reporter to write up his thoughts on Thirteenth Avenue. The article was substantially similar to the piece from 1883, though the new reporter did spend more time sampling the local saloons. He was particularly impressed with the saloon that served passengers bound to Hoboken on the ferry, which sat on the ground floor of a six-story brick warehouse. By the turn of the twentieth century, the area was changing. The city began investing in improvements to the piers, in particular to be able to welcome the ever-growing class of luxury steamers (which would soon include the Lusitania and the Titanic). In order to build deep water piers that did not interfere with exiting navigation on the Hudson, the city began removing landfill east of Thirteenth Avenue—effectively destroying the street to make room for what today we call Chelsea Piers. Somehow, however, one tiny block of Thirteenth Avenue never got removed from the map. If you cross the West Side Highway at Gansevoort Street, you reach a sanitation pier (and the name of the road officially changes to Bloomfield Street). If you were able to get to the sanitation parking lot along the river’s edge, you would be on the only remaining block of Thirteenth Avenue. Today was the annual gathering of the Fire Department in Riverside Park to pay tribute to their fallen comrades at the Firefighters' Memorial at 100th Street. Thousands of fire personnel attend this ceremony each year, which shuts down Riverside Drive for a number of blocks on either side of the monument. The memorial itself was installed in 1913 and unveiled by Mayor Gaynor--one of his last official acts before his own death. The idea behind honoring New York's firemen came from the city's Episcopal Bishop, Henry Potter, who was the chairman of the memorial committee. Potter lamented the fact that in a city that was quick to honor less deserving citizens, no one took the time to commemorate these "soldiers in a war that never ends." 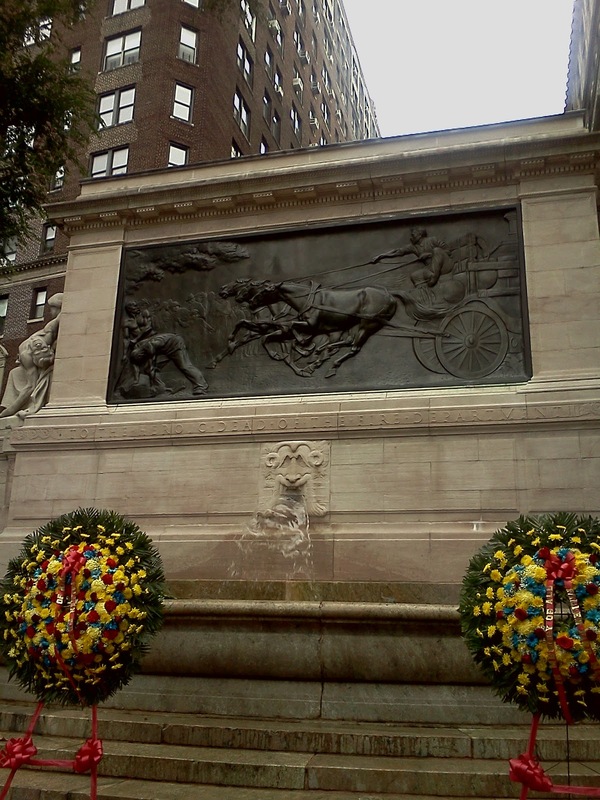 Originally slated for Union Square, the memorial was ultimately landscaped by architect H.V.B. Magonigle specially for this spot at 100th Street. The carvings are by Attilio Piccirilli, who, along with his many brothers, was part of the greatest stone carving family in the city. (The Piccirilli brothers work can be seen at the USS Maine monument in Columbus Circle and the Museum of the American Indian on Bowling Green, among many other places.) On the front, a horse-drawn fire engine races to a blaze; on either side, allegories of Duty and Sacrifice flank the main fountain. Few people who don't live in this neighborhood ever explore the statuary in Riverside Park, but this monument alone is worth a trip to the Upper West Side. Both the United States and the Soviet Union had announced in 1955 that they would put a satellite in orbit during the IGY. 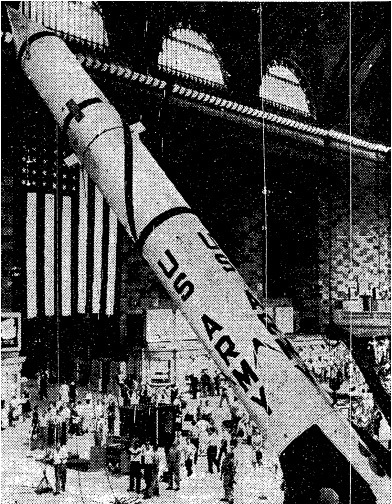 At first, the United States backed the U.S. Army's Explorer program, which planned to use a Redstone ballistic missile to launch a satellite. When the IGY began on July 1, 1957, the United States had little to show for it. So, the Chrysler Corporation, the Redstone's manufacturer, decided it would show the American public just how impressive its products could be, and arranged to have a missile installed in Grand Central Terminal. In the first week of July, the missile arrived by train from Detroit; the cargo was shunted onto track 16, because the entrance to that track (today partially hidden by a food vendor) was the only one wide enough for the missile to pass through. Over the next few days, the sixty-eight-foot tall Redstone was assembled in Grand Central's main hall. Though the missile was short enough to fit, it needed to be held in place by wires at the top. To achieve this, a hole was punched into the roof--and it's still visible to this day. If you look at the zodiac on the terminal's ceiling, find the fish that make up Pisces; near one of the fish is a dark circle in the roof: that's where the missile was held aloft. The Redstone stood for three weeks, allowing thousands of commuters to see the weapon that the New York Times said could "[deliver] an atomic punch 200 miles." Which was to say--we may not have a satellite in orbit yet, but we can blow you away. By the time the Redstone was put on the display, the U.S. had moved away from the Army's Explorer program in favor of the Navy's Vanguard program. However, when Sputnik achieved orbit on October 4, 1957, it lit a fire under the United States and government rushed back to the Explorer program. On January 31, 1958, Explorer 1 achieved orbit and began the United States' exploration of space. The Explorer program is still active to this day. Greetings! Just a reminder that if you want to sign up for our walking tour of Central Park and the Upper West Side next Sunday (with a focus on Columbus Day and Italian-American history), your last chance to get the discounted price of $10 per person is today. Any reservations made through midnight tonight (EST) will be just $10 per person; tomorrow the price goes up to $15 per person. 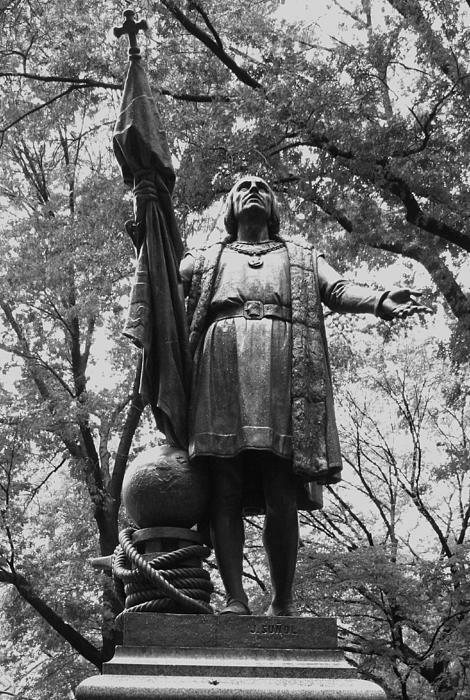 The tour is Sunday, October 9, at 3:30PM, and we'll walk for about 90 minutes, covering topics as wide ranging as the origins of Columbus Day to the anti-immigrant ideas embodied in various places along Central Park's famous Mall. You can read more about the tour at http://blog.insidetheapple.net/2011/09/christopher-columbus-and-central-park.html, including complete instructions on how to reserve.